I love Neil Gaiman. I love his attitude. I love his wise words. And I love this quote. So I posted it. I posted it online because it seemed fitting. It seemed like a gentle reminder to not strive for perfection, but rather to strive for evolution. I stumbled upon it again tonight. Lying in my bed, with the sounds of spring outside my door. It’s almost October. That’s quite a few months since the last time I read this quote. Heck, it’s almost a year. If I close my eyes, I’m right back there, on that futon, in Bronte, with the strange taste of hot oil and the sea in my mouth. The days have hurtled into months and this quote found me again, tonight, of all nights, after a weekend spent drawing metaphorical lines in the sand. I’ve made some good mistakes this year. I’ve made a few bad ones. I’ve made things and broken things and mended things. I’ve kept moving, mostly forward, occasionally sideways, without ever freezing. I’ve learned. Goodness, the things I’ve learned. And I’ve lived. I’ve lived boldly and passionately and without any reservations. I’ve changed. I am not the exact same person as I was on that last night in December, lying on that futon. I think mistakes are good things. Despite the overwhelming bad wrap they get, mistakes, messy though they sometimes may be, make you grow. They force you to grow. Some of my mistakes have been insignificant, some have been diabolical, but they’ve all helped me evolve into who I am, right now, right here, lying on my bed. 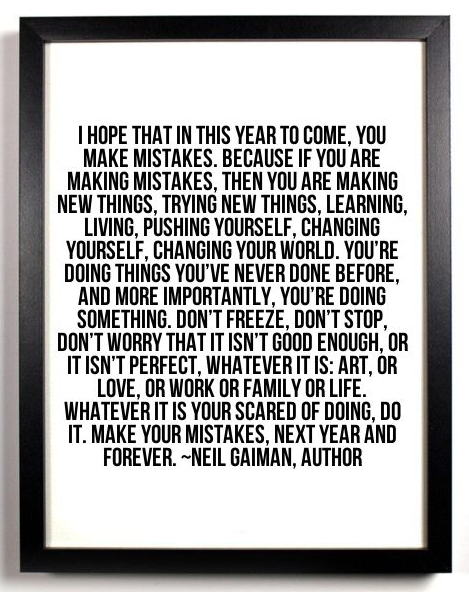 I feel fortunate to have been afforded the opportunity to even make the mistakes I have this year. And that’s the thing about mistakes; people try to avoid them. They try to excuse them. But the very best thing you can do is embrace them. Own them. Who you choose to be, who you get to be, after them, well, that’s yours for the taking. → Why I’ll Hop On The Bus. Every Damn Time. Great post which totally rings true. Mistakes temper our judgement in a way that blind success never will.